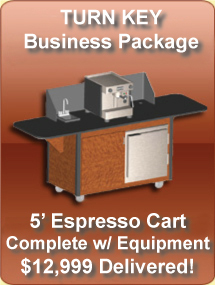 This is the ultimate platform for hot and cold espresso beverages and smoothies. This cart features refrigerated storage AND freezer storage. Offer frozen treats, or use frozen yogurt and ice cream in your recipes, you have a large 6.5 cu ft frozen storage capacity. 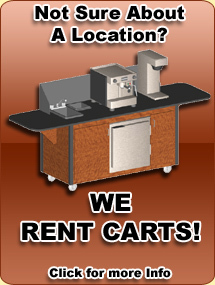 Built with the same rugged steel frame and waterproof interior panels as our other models this cart will offer years of reliable service, with capacity to handle the busiest vending locations. Ample counterspace allows use of two group espresso machine, grinders, and blenders all at the same time. Of course a complete water system, and 50A 220v electrical system are standard. Request info to find out more!